Despite their individual international carreers, the band members keep seeking each other’s musical company. 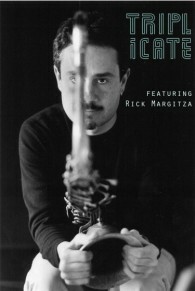 Major jazz magazine Jazzism recently rewarded Triplicate’s last album “Call of the Wild” four stars. The seeds of the collaboration with the lyrical Miles Davis – veteran Rick Margitza were planted at the Java Jazz Festival, where Ellister and Rick shared the stage. By teaming up with this legendary master of the saxophone, Triplicate wants to double the fun.